"I push my chest voice up to belt"
"I need more breath for belting"
"I have to belt the whole song"
You definitely need Belting Explained! International Masterteachers and vocal consultants Gillyanne Kayes and Jeremy Fisher have been teaching singers and actors in London's West End for more than 50 years between them, and have been running Belting Explained! courses every year since 1998. There's so much on this double DVD set it's difficult to know where to start. Built into the warmup are the techniques for getting you to belt. Then each technique is broken down for you to experience. We learn in different ways, so there are ideas, facts, shapes, sounds and concepts throughout the two DVDs to help you discover happy, safe belting using your favourite learning mode. The belting warmup - We start with live footage of Gillyanne's targeted belting warmup, taken from the sellout Belting Explained! course. First, Gillyanne works with an individual singer - this is their first meeting so you can see how Gillyanne analyses and works with an unknown voice. Then she takes the entire group of singers and teachers through the process of warming up for belting. The group teaching sequence is 13 minutes, so once you've learned it, the warmup itself is a lot faster. No more endless scales and vocalises or 30-minute vocal warmups to struggle through before singing. Individual technique 2: height and space - find how to take a thicker, stronger sound higher in your vocal range. You need a particular type of height and space inside your throat, and the exercises in this section show you exactly how to find it. And that's just DVD 1! Individual technique 5: the voice-body connection - putting your back into it helps you connect your body with your voice to support the strong vibrations your vocal folds are creating. This exercise shows you exactly how to find the largest muscles in your back, and how to switch them on and off at will. And you don't need to be shaking with effort! Individual technique 6: Your jaw - the jaw is a willing slave, it will get involved at any point whether it's needed or not. Discover in this technique how to monitor your jaw and how wide your jaw actually needs to be to belt efficiently (you might be surprised at this one). 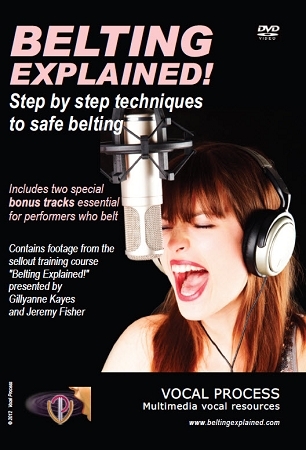 Making belting noises is great, but to belt effectively in a song, you have to use words. And they carry their own problems. So we continue on DVD 2 with working vowels and consonants separately. Individual technique 9: Sorting the consonants - some consonants are far easier to belt than others, so if you're having a problem with a belt word, it might be the consonants that are getting in your way. The technique we use here comes from speech therapy, and helps you identify what the consonant is, where it's made, and what you have to do the improve it. And this technique can be used on ANY consonant or consonant cluster. Targeting problem words - You'll discover five easy steps for targeting problem words. And we demonstrate them using real industry examples (male and female). You have the opportunity to pause DVD 2 and practise one of your own target belt words. And we're still not finished yet. 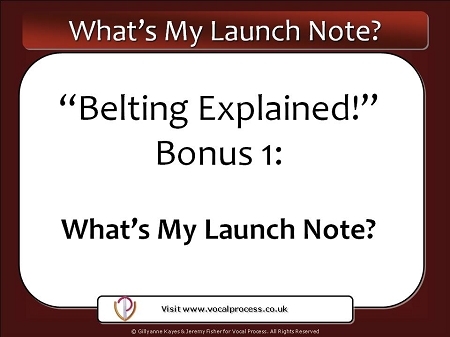 Then there's the role of motivation and commitment in belting - why you need them to make your belting work well. We talk about why you might belt a note or build a phrase towards a belted climax. And what happens to your belting if you're not physically committed to it! And we've included a four-minute video of a coaching session by Jeremy in our Masterteachers Tour of New Zealand and Australia. You'll see Jeremy working with a singer on the belted phrase in "I Don't Know How To Love Him" - and why adjusting the physical and emotional commitment in just four minutes makes such a difference to the performance (watch the audience reaction at the end!). And we give you Three Next Steps to take to embed all the techniques and information you've learned on both DVDs. Bonus 2: Creak Cool. This is one of our most invaluable techniques for warming down. Because belting is a high-energy, high-intensity sound, you'll need to reset your voice to a more normal speaking mode after you've been belting. Creaky voice is one of the most useful of the speech therapy techniques we use to release any tension or vocal fold bulking you might have used to belt. In this bonus film we give you three different ways to find healthy creak (and yes, there is an unhealthy version to avoid). We also give you two entirely different uses for creaky voice, and tell you when to use it to reset your voice. Your inner belter needs these DVDs! Sopranos: "Bel canto, can't Belto?" Do you want to learn belting yourself but don't want to ruin your classical singing? AND sing with a legit sound, often in the same song. The techniques you will discover on these DVDs will help you change vocal set-up safely and without disturbing your classical techniques or legit sound. Teachers: Do you need to teach belt but don’t know how to do it? Here’s the bottom line – your students will attempt to belt whether you teach them or not. 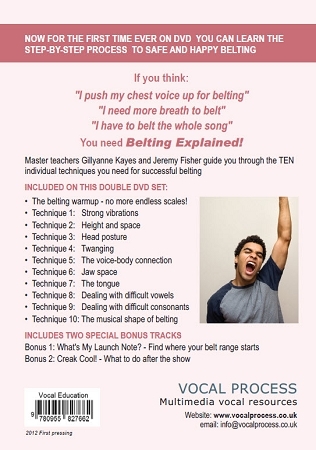 Use these DVDs to encourage your students to discover what safe belting is, how it's made and when you use it. Actors: Do you need the job but are not sure how to belt? Contemporary West End, Gospel, and Rock all require belting - it's the "high" in many West End performances. 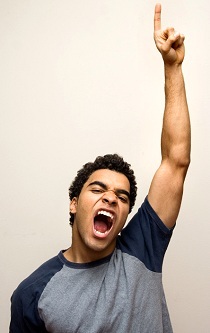 Learn a great belting warmup (classical vocalizes do not prepare you for belting). Discover the mixes that are a great preparation for belting and find more interpretive choices. 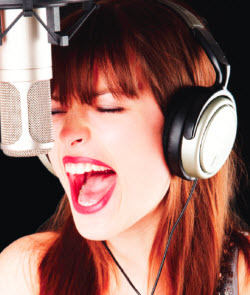 Get the money notes that will flatten the opposition in auditions, and learn how to ramp up the excitement in a song.